The new version of Windows Server, 2012 R2, is more than just an iterative update according to Satya Nadella, Microsoft's executive vice president for cloud and enterprise; it's also giving you cloud advantages. Some of those are in your own server. "This is not just the next version of Windows NT that you install," Nadella told us. "When we talk about these releases of Windows Server and System Center, they're derived from running them underneath Azure. We compete with VMware on virtualisation, we are gaining share, and that's not because we woke up and decided to build the next big hypervisor but because we are learning every day how to build a hypervisor that's fantastic because of our Azure feedback cycle." But Microsoft also wants you to connect to its cloud services and use them as part of what Nadella calls a 'boundless' data centre. This new version of Windows Server is significant in what it allows you to do for compute and storage network virtualisation. But it's also what you can do on the public cloud. If you set up a SQL Server, you have an automatic always-on secondary on Azure. If you set up Windows Server, you have backup on Azure." 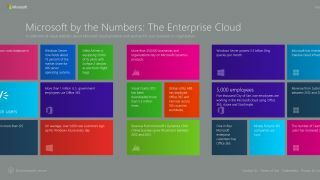 The majority of Azure usage (70%, says Nadella) is people running virtual machines and using it as part of their infrastructure rather than just using the services on the cloud service; he claims Azure is the number two public cloud behind Amazon. That's not all Windows Server VMs either; "Our Azure mix reflects the market share of Windows and Linux," he says, although he also claims three out of every four servers in the world are running Windows. We've already looked at the way Windows Server 2012 R2 adds remote desktop and web app support for connecting from iOS and Android and OS X systems and he says the same is true of the upcoming release of Intune. "We are not talking device management for Windows; we are talking device management for iOS and Android and Windows. Most people define openness as everything that is not Windows; my definition is everything including Windows." But just because Microsoft is ready for the cloud and frequent updates and users with touch devices doesn't mean its business customers are. "Just because we are updating on a regular basis doesn't mean we expect everyone on the infrastructure side to stay current with us. We are looking at the way we deliver so we can move the host at a different frequency, the guests at a different frequency, the workloads on top of that at a different frequency. You see some of that in the R2 release of Windows Server and System Center. We believe velocity is important but that does not mean we can disrupt a lot of customer investment because economically you have to drive the benefit of the infrastructure investment people have made." Microsoft knows it can't stay where it is. "There's no notion that we're trying to just do what we did, in the future," Nadella told us. The infrastructure business we had was fantastic – and it's still got a lot of gas in the tank - but the key is are we building the fabric that is cloud native, that manages storage and network and compute in a unified way, and at scale? That's what we're doing on the back end, I think that's the future"
Windows 8 was also a big move towards the future. "You know most people miss this. Yes, it has desktop but it committed three massive decisions, from silicon [with ARM support] to the app model to the user experience. We said this is a touch first experience and that's going to be the future in what we see on phones, and on tablets and in the big screen devices." It's about striking a balance between where your customers are now and where things are going. "I feel what is important for us is to see these new things and not just be beholden to what we had in the past but to really do the innovation. Sometimes there will be some backlash because we kind of go too far and people say 'hey I love this thing! where is the bridge?' You could say the IaaS support [on Azure] was that, because it is important for us to have bridges. You can't ignore bridges. Those are the things we have learned." "The key is if you don't get the future right, then just having a bridge is not going to be important. But if you get the future right and you are missing a bridge or two, you have the time to build those bridges." You can read our review of Windows System Center 2012 SP1 and InTune 4 here.